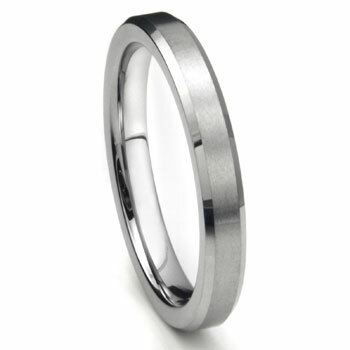 The tungsten 4MM beveled brush finish wedding band has two different and distinctive looks in one wedding band. The beveled edges are seen as high polished silver, while the center is satin finished giving it a matte appearance. The contrast works well with this wedding band, and lends an elegant refined tone to the tungsten ring. With the tungsten metals used the wedding ring will not scratch or tarnish , so it will always last a lifetime. This wedding band will stand the test of time, always look like its brand new, and will always wear easily with comfort fit design. We thought we were taking a risk ordering our wedding rings online without trying them on or seeing them in the flesh. But they could not be more perfect, we love them, they look amazing, the fit is perfect and the service could not be faulted.